Our professional use of Birds of Prey for rabbit control service gives a unique perspective that heightens effectiveness. Using hawks for rabbit control isn’t often the first method that comes to mind, but they are extremely effective when used for rabbit control. Hawking involves the use of either one or a group of highly trained Harris hawks whose job it is to catch rabbits. The hawks we use are conditioned to work alongside our trained ferrets and dogs which are successful at flushing rabbits from their burrows or areas near vegetation. Our Bird of Prey service works by positioning the hawks above each falconer in nearby trees to enable the best possible view of the control area whilst checking for rabbits. By doing this, it allows the hawks to have an optimum field of vision. Should a rabbit move, bolt or even blink in the control area, our hawks will easily be able to spot and swoop to catch the desired rabbits. Using a hawk as a method of rabbit control is often complemented with the use of long nets to enhance effectiveness. When to Use Birds of Prey for Rabbit Control. Operating in The UK and Ireland, we most commonly use the method of birds of prey for rabbit control when tasked with preserving woodland areas. However, Birds of Prey can also be used in a variety of other circumstances including urban and rural regions that do not permit the use of firearms or where dogs are not a suitable attribute to the team. Facts about Birds of Prey. 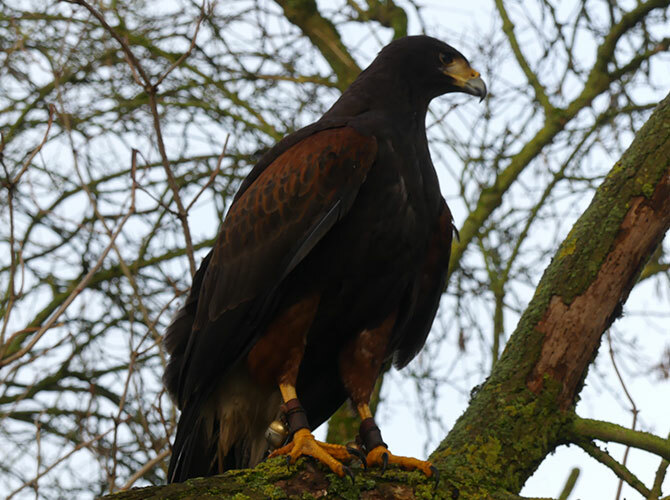 Our Harris hawks naturally hunt in groups in the wild. A hawk’s eyesight can be 8 times more powerful than that of a human which means they are 8 times less likely to miss spotting a rabbit. Why You Need Birds of Prey for Effective Rabbit Control. Using Birds of Prey as a method of rabbit control is a natural one. By using this avian perspective gives our a control programme a unique approach which lends itself understandably towards the phrase “eyes like a hawk”. An advantage of using Birds of Prey is that nothing is required to be installed or maintained for the operation to be resolved as quickly as possible. Alongside our professional and qualified handlers, we can schedule visits to the area based on your requirements and scale of the problem. We have effectively relied upon rabbit control with birds of prey in many locations. Contact us here to find out more about this method and how it could help you. We employ a wide range of extremely effective methods of rabbit control involving the use of high powered lamps. Professional ferreting is a highly effective form of rabbit control. Ferrets are normally used to bolt rabbits from burrows.